Acadia National Park is a national treasure. A tribute to the creativity and power of God. Mary and I just concluded a week in Bar Harbor, Maine that included an exploration of several of the robust Acadia hiking trails. While notably different than the trails we’re used to in Colorado, they were equally as awe inspiring and grand. Unlike the hikes in Colorado, there is a common thread that accompanied every hiking trail in the National Park. A small light blue stripe, approximately one inch by four, provided the much-needed assurance to both safe passage and mission accomplishment. The blue marks were placed frequently, but never too frequently! Most of the time they appeared on rocks, but sometimes on trees. This was a good thing, as the trails were often hard to follow and sometimes even counterintuitive. The blue line showed the way. Precisely. Dependably. Faithfully. Even the angle of the line mattered. Every detail. Every position an indicator and guide. At times the trail was also identified by cairns, a classic Colorado trail marker that is essentially a pile of rocks, placed by individuals to show the way. They’re not anchored or authored, but generally trustworthy. There are also the telltale worn pathways that can aid in navigation. These paths have been established over time by the feet of other hikers. Hikers I don’t know, who may or may not want to arrive at the same destination that I do. Three modes of trail navigation. Three distinct guides through the varied terrain of Acadia. As for me, there was no question in my mind which I wanted to follow. Give me the blue dash every time. It had been placed with care by the National Park Service. Their credibility was on the line. They were the men and women in the distinct uniforms with name tags. I could find them, ask them questions, check their credentials. The other two methods of navigation represented the best efforts of others. Well meaning, and most often on track, but not authoritative. The cairns, often a welcome and confirming sight, were temporary. Moveable. Vulnerable to the whims of a scoundrel or an inquisitive child. And at various times the well-worn path worked its way to a dead-end cliff. An awe-inspiring viewing point, but not the way to the top. In fact, potentially deadly. But not the blue lines. They were true and sure and right. 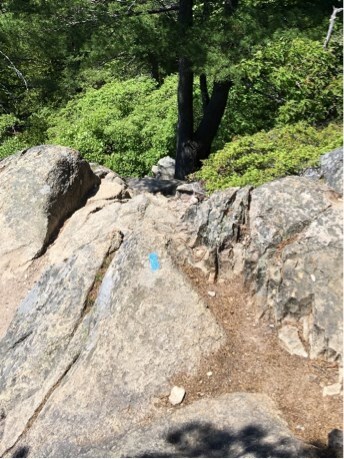 Mary and I safely journeyed to the top of three summits in Acadia National Park because we followed the blue lines. Unflinchingly. Sometimes against my instincts. Sometimes in defiance to a well-worn path. But always confidently. Always with hope. My pure blue line. God’s Word. Make no mistake, Godly men and women make beautiful markers along the way… theological cairns that bring comfort and confirmation, but they are no replacement for the blue line. There are also times when the saints before me have worn a path that is helpful and reassuring, but only when it aligns with the blue line. Acadia. Awe inspiring. And a profound and life-altering picture of the beauty and comfort of God’s unfailing Word.